alaTest has collected and analyzed 4 reviews of Pure Digital Flip Mino HD. The average rating for this product is 3.0/5, compared to an average rating of 4.0/5 for other Camcorders for all reviews. Reviewers really like the design and usability. The memory and color also get good views. There are some less positive views about the size and battery. There are some mixed views about the image quality. We analyzed user and expert ratings, product age and more factors. 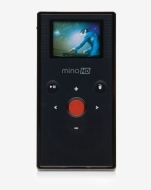 Compared to other Camcorders the Pure Digital Flip Mino HD is awarded an overall alaScore™ of 78/100 = Good quality. The originator of the YouTube camcorder adds high-definition recording to its arsenal of mini video cameras with its Flip MinoHD. Records high-quality HD video. Compact. Double the storage of the original Flip Mino. Small screen. Memory isn't expandable.